Normal to Natalie: Meet the Flinstones! We had a yabba dabba do time, we had a good time, we had a gay old time! 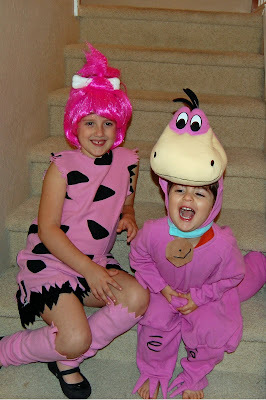 Pebbles and Dino had a fabulous Halloween weekend! They loved their costumes. James would only bark while wearing Dino and if I called him James while he was wearing the costume he would say, "I no James... I DINO... ruf ruff ruf!" Too cute! Now go visit the costume parades over at SITS and 5 Minutes for Mom. awe!!!! love it, great costumes!! Love the costumes! My oldest was Pebbles one year. So cute. Oh my gosh, aren't they a cute duo!